Rachel always had a love for architecture and interior design. At a young age, she would rearrange her bedroom furniture, seek out open houses with her parents, and watch This Old House with her dad every Sunday night. 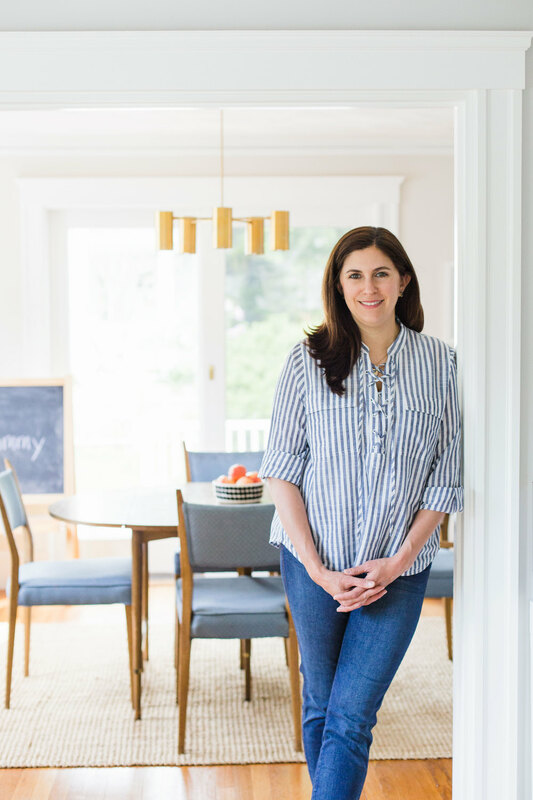 After purchasing her first home with her husband in 2009, this love of design was sparked again and she decided to go back to school to begin taking steps to fulfill this passion as a career. She began taking classes at the Boston Architectural College shortly thereafter and received her certificate in Residential Interiors in Spring of 2017. Rachel's style ranges from transitional to eclectic to modern. She loves a pop of color, mixing patterns, and bringing interest through texture in her designs. She's a pro at mixing high and low end pieces to create the perfect space and is comfortable incorporating both new and existing pieces into her designs. Rachel also works across a range of budgets and often works with everyday families like her own. Prior to starting her own company, Rachel worked in digital marketing for over 12 years where she managed digital marketing, creative, and social media for brands including T.J. Maxx, Glidden Paint, and New Balance.